The new ‘Happy Saints Jesus' Family and Friends’ eBook is a great resource for Holy Week and Easter! Featuring the Lord Jesus, Mother Mary, St. Joseph, St. John the Baptist, the Archangels and many of the saints who were present during the Passion and Resurrection of our Lord (St. Mary Magdalene, St. Mary Salome, St. Nicodemus, St. Joseph of Arimathea, St. Cleopas of Emmaus etc.). How about meeting Jesus’ close friends in Bethany - St. Martha, St. Mary and St. Lazarus? This is the best season to introduce your family, students or parishioners to these New Testament characters! 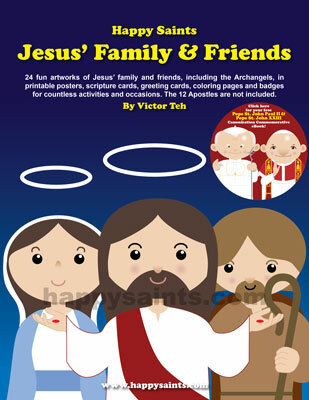 This special edition ebook features 24 artworks in printable posters, prayer cards, coloring pages, greeting cards and badges of Jesus’ Family, Friends and the Archangels. For a limited time, this ebook comes with a FREE Popes St. John Paul II & St. John XXIII Canonization Commemorative eBook! Our beloved Popes will be canonized on 27 April 2014! This complimentary ebook features printable posters, cards and badges of the two Pope Saints.